Elections tell us a lot about ourselves, sometimes with breathtaking clarity...The picture revealed on November 7, 2000 was a split image...a nation divided in almost every conceivable way..."
Kenneth T. Walsh "Crossing the Great Divide,"
Let me be the bridge to an America that only the unknowing call myth. Let me be the bridge to a time of tranquility, faith, and confidence in action. In 1996, William Jefferson Clinton was running as a sitting president. He would be the first Democratic Party presidential candidate to be elected twice in more than half a century. It would only be appropriate that someone his age would take us into the new century--the new millennium. In The Bridge to the 21st Century: Reflections on the Soul of a Nation, author Cary Coole ponders what these intriguing speeches revealed about both men and our nation--if we listened carefully, Coole says, we could get a sense of two Americas. One man was rooted in the past and wanted desperately to bring something he felt, but was hard to define, into the future; the other was focused on the future but made it clear he did not want to build a bridge to the past. What Dole found so difficult to define and Clinton found so easy to overlook was our soul - the soul of our nation. In the sixties and seventies, when Clinton was coming of age, a portion of our citizens entered into a covert, unspoken agreement to amend the Bill of Rights. A New America began to emerge; Old America was becoming passé, obsolete, and unfashionable. 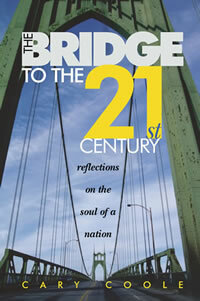 To reserve your copy of The Bridge from the 21st Century: Reflections of the Soul of a Nation, contact Portland Publishing House.